The teachers of my youth were seemingly embalmed in cheap tweed jackets with leather elbow patches, lightly coated in chalk dust, and masters of the withering stare – often closely followed by a well aimed chalk duster. Intimidation and coercion were their preferred methods for motivating their students. They singularly failed as role models, giving me little grounds to think that I would one day follow in their footsteps. But to my unending surprise, I find myself teaching for a living: and, worse than that, enjoying it! To be fair, the circumstances are somewhat different. I’ve swapped the dingy classroom for the great outdoors, and learning from dog-eared textbooks for hands-on experience in some of the most beautiful landscapes in the world. There’s no security of tenure and the wages aren’t that great but the job satisfaction is immense. For me, that satisfaction comes from two things; the broadening of my artistic horizons that teaching has brought and the pleasure of seeing my students grow in photography. The dialogue that I have with students and the need to analyse how I work has immeasurably altered and improved my photography. To teach a subject well you need to be able to dissect it and pass on your findings to your students. Before I was invited to lead workshops I made images more or less completely instinctively – at least at an aesthetic level, technique is something that has to be more consciously studied. I’m pretty sure that this is how most people work. There is usually a right way or a wrong way when it comes to technique – or at least an optimal and a sub-optimal way. Technique needs to be understood in a logical, straightforward way and this make it relatively easy to teach as you can take a step-by-step approach. But trying to pick apart our aesthetic judgements when making images is a much less straightforward matter. Most of us struggle to vocalise how we arrived at a particular composition or why we feel that it works or doesn’t work. In fact we habitually rely on feelings rather than analysis. In a way we can hardly do anything else because, firstly, there is no single ‘right’ answer when we make an image (more on this later) and secondly because we actively want the image to express our feelings about the subject and not to simply illustrate it. But I feel that in order to become a good teacher of photography you simply have to find a way of explaining that procedure, either through looking at your own work or by critical analysis of another’s. The whole process of examining how I make images in order to be able to teach others has become a virtuous circle for me, leading to new revelations in how to make my own images which feeds back into new insights to pass on to my students. A good workshop leader doesn’t simply deliver facts to be learnt by rote, rather they have to be open to fresh ideas and eager to engage in meaningful conversations with each participant. These conversations, be they technical or aesthetic, should then be enlightening and enriching for both student and teacher. When I began teaching photographic workshops I had no idea how involved I would become in the photographic journeys of my students. Seeing how students grow in confidence and find their own voices has been both a revelation and a deeply rewarding experience for me. For most students the journey that they undertake is quite modest; they wish to master the equipment so that they might make a faithful “copy” of a landscape that inspires them. For others it is a much longer and harder journey: one in which they move from making illustrations to making images that do much more than describe. It’s equally rewarding for me to see a student progress along either path. Whatever their ambitions, two things are absolutely clear to me; the student needs to make a serious commitment – they can’t expect to improve without applying themselves – and they also have to believe in themselves. There’s no magic wand that a tutor can wave over the student that will transform them into a great (or even good) photographer overnight. As I noted above, technique is reasonably easy to pass on and I have seen workshop participants move on in leaps and bounds technically in a matter of a few days. But to me enhancing the student’s experience in this way seems the least that we can do. After all, mastery of technique alone won’t make them a good photographer. (Nor will simply plonking them in front of an inspiring landscape, as some photographic tour companies seem to believe.) To develop as a photographer one needs to pay as much, if not more, attention to aesthetics as to technique. It’s the tutor’s job to help the participant achieve the right balance. With such a guiding hand the student can develop their own voice, their own personal style of photography. Sadly there is sometimes an unreasonable expectation of how quickly one might progress. I’ve written elsewhere about how 10,000 hours practice is the minimum time required to become truly proficient at anything. So a one-week workshop isn’t going to transform anyone from a beginner to competent or from competent to masterful. There’s simply no getting around the fact that it’s a much longer journey than this. You might find it disheartening that you can’t just read a manual in order to achieve mastery of photography but there is no getting around the fact that it requires regular practice combined with a focused way thinking. The key to this is adopting a different way of solving problems to the one we employ in everyday life. Most of the day-to-day problems we encounter in life present themselves as convergent problems with a single correct solution, e.g. 2 plus 2 irrefutably equals 4! In contrast, art presents us with divergent problems with many different but equally valid “correct” answers. This leads us to a question rather than a definite answer: which composition should we pick from the host of alternative possibilities available? This is where the tutor can really help the student by sharing their hard won expertise at the point at which an image is made. Lessons learnt in these circumstances really stick with the student. But there’s little benefit to be gained from the tutor being either prescriptive or proscriptive, taking this approach only leads to the production of artistic clones of the tutor. One man who travelled with Charlie Waite to Andalucia a number of years ago would always utter the same querulous phrase whenever the group reached a location: “So, Charlie, ver is ze picture? !” Charlie could simply have given the man a “Charlie Waite” but ultimately it’s better for the student if they are helped to find their own solution. The leader, therefore, needs to allow the student room to make their own choices, including making mistakes! Sadly humans learn far more readily from their failures than from their triumphs. That’s not to say that I would ever leave a student entirely to their own devices. And there are even moments when urgent intervention is called for. On a trip to Provence four years ago the group were photographing the beautiful hilltop town of Gordes from a rocky ledge above a deep ravine. I noticed that one of the tripods was in an unstable position and was worried that the camera might blow over in the stiff evening breeze, something that happens surprisingly frequently. So I turned to the lady whose camera it was and proceeded to give a sermon on the dangers of not spreading her legs – always a delicate subject, especially when the client isn’t a native English speaker. At the end of my speech she stared at me blankly for some time and then said in a slightly puzzled voice, “But it’s not my camera…” The real owner was sitting shame faced a couple of feet away and had, perhaps wisely, chosen to remain quiet throughout my lecture. My aim is to be available to offer advice and guidance whenever needed but most of the direction I offer is necessarily subtle rather than blatant. Some participants are unfortunately unable to appreciate the need for this – at least initially. I vividly remember a client on one of my workshops in the Scottish Highlands complaining that they couldn’t find any images at a particular location. I advised the man to find a spot and just sit still for a few minutes, “Inspiration will come.” I assured him. From the look I got I’m sure that he felt he was getting the brush off. But thirty minutes later he came over to tell me what a great image he’d found and what a profound lesson he had learnt. So in some ways a tutor’s task is simply to steer the student in the right general direction for their artistic journey, helping them avoid the worst obstacles. A major part of what the tutor provides for the participant on a workshop is confidence. We each need quiet self-belief in order to manage our voyage of artistic discovery. Unfortunately self-criticism is essential to the process so we need to guard against self-doubt. Any photographer needs to believe that what they have to say is worthwhile. Only then will they have the confidence to move beyond making banal and vacuous pastiches. A poor mentor will prevent you from leaving their shadow but a great one will help you find your own place in the light. I’m always very aware that clients have chosen to spend their valuable leisure time with me so I work hard to try and ensure that everyone is enjoying themselves. Sometimes I feel more like a Butlins Redcoat than a photographer, though you’ll no doubt be relieved to hear that there’s never a knobbly knee contest on any of my workshops. Perhaps I take the humour too far sometimes and people lose sight of my serious intent. 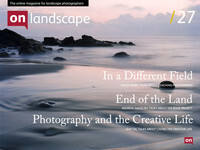 A number of years ago a lady on a large format workshop borrowed a copy of my first book, Landscape Within, one evening. The next day she approached me over breakfast with a slightly shocked expression and told me in a very earnest tone, “There’s more to you than meets the eye!” A backhanded compliment perhaps, but one that I was happy to accept. So what can a student expect on a tour or workshop? Well, it won’t be (as one recent participant was pleasantly surprised to find out) like attending the most boring camera club evening you can imagine but five days long! There will be plenty of laughs as well as amazing opportunities to make images. Many people worry before they go on their first photo trip that other participants will be snooty about a perceived lack of knowledge or high end gear. In my experience nothing could be further from the truth and everyone is very keen to share their knowledge, which further enhances the learning experience for all. Another great advantage of going on a workshop or photo tour is the chance to completely immerse oneself in photography for a number of days without worrying about one’s significant other! We’ve all been in the situation at one time or another when we want to make an image but worry that our companions will become bored whilst we mess around or wait an hour and half for a cloud to move. Time should never be a concern on a workshop. I aim to go to between 3 and 4 locations in a full day out which gives plenty of time at each to explore and find images beyond the obvious. Much is made of the magical quality of the light at dawn and dusk, and I would certainly take the group out then if the weather is favourable, but it’s equally important to teach the participants how to work with different light and match it to locations. The leader therefore needs to know the area of the tour intimately and be willing to change their plans at a moments notice to make the best of the conditions. I will always have a number of different locations in mind during the day and keep my options open depending on what the weather throws at me. You can dismiss from your mind – at least on my tours – the notion that everyone will meekly line up at my command, cameras on tripods, and make the same image. Last November, I was in California with a group and watched in disbelief as an American tour leader (I’ll save his blushes by not naming him) told his group to do exactly that. We were at the Patriarch Grove, 11,500ft up in the White Mountains and home to 5,000-year-old bristlecone pines, some of the oldest living trees. I find this one of the most inspiring places I’ve ever visited and somewhere that offers a huge range of possibilities for photography. Yet this other group stayed barely forty minutes and stood in a row to photograph a single fallen tree. My group stayed nearly three hours and spread across a wide area making a diverse range of images. In my experience (and I’ve now led close to 100 tours and workshops) it’s vital to give each participant the time and the room, both physically and artistically, to explore their own potential. Anyone who regularly reads printed periodicals on photography (shame on you!) can hardly have failed to notice the proliferation of adverts for photography workshops and courses. Not so many years ago there were barely half a dozen providers in this field in the UK but I now estimate that there are over fifty. On the face of it this seems a very positive development. It would appear to show a healthy demand but I wonder if the clientele’s expectations are being met – or, more importantly, exceeded as they should be. There are two main issues that need looking at here: the provider’s level of experience and their motivation. The question of experience is a tricky one - as one man’s expert is another’s beginner - but I wonder how large a proportion of the many people offering their services are actually equipped to do so in terms of expertise and teaching ability. Certainly the standard of photography on many of the providers’ websites is quite poor. And even when the images look good there’s no guarantee that the photographic leader in question can teach. People skills are every bit as important as photographic skills. My view on this should rightly be balanced with the realisation that not everyone wants to learn from a high profile photographer. Many find the idea of travelling with Joe or Charlie or another big name intimidating. They’re probably not looking to do more than travel with their camera and learn the nuts and bolts. The problem comes when someone advertises himself or herself as being an expert but can’t back up that claim with deeds. • Doing so helps participants to understand how a photographer works – learning by example is one of the best ways. • It can provide participants with fresh insights and inspiration. • It helps the clients to feel confident that a subject that they wouldn’t normally shoot is worth attempting. But tour and workshop leaders are, first and foremost, being paid to provide tuition and support. So making their images should never come first. If they aren’t being paid enough to make this the case, as one workshop leader complained to a client of mine, they shouldn’t be in the game. Clients have paid for a photography trip but I don’t think that it should all be about photography. I want my clients to go home from one of my tours or workshops feeling not only that they’ve learnt something new and exciting about photography but, just as importantly, that they’ve had a great time, been to some fantastic places and met some interesting people. And for me it’s wonderful to pass on my knowledge to people who are eager to learn. Two of my regulars have travelled with me over twenty times without me ever having to threaten them with detention or lines so I hope this means I have the balance about right but one should never get complacent and the students must always come first. How different that is to how I remember my school days. You can see more of David's work at his website Into The Light where he has recently posted images to his 'latest' and 'sketches' galleries.